Over the Christmas break, I wanted to see a Christmas movie. I wound up seeing The Family Man because it looked somewhat like a Christmas movie from the previews, and I couldn't get my friend Jaisen to see The Grinch. From the previews, I knew pretty much what to expect. And for the most part, I was right. As far as the plot goes, there's not much to it: a single yuppie living a "successful" life of extravagance, power, and fast women is given a glimpse of what could have been had he settled down and started a family. Sound familiar? It seems like the basic story-line is a mix between Charles Dickens' A Christmas Carol and It's a Wonderful Life. Both are Christmas movies, and both emphasize the importance of relationships over that of money or wealth. Furthermore, both get their point across via a "what if" experience brought to them by either a ghost or an angel. And The Family Man is not that much more original, it is just set in a present-day environment. What I did not expect was how much this movie would move me. It's amazing how this simple plot could be so powerful. Upon reflection, I see how this movie accomplishes the virtually impossible (as its predecessors were able to do as well). Philosophize with me a bit, if you will. We live in a world of consumerism, where it seems what everyone strives for is more money, more toys, and more attractive partners. He who does not commit his life to the pursuit of these things, he who does not put in the extra hours at work, and he who does not wind up driving the latest car or purchasing the biggest home is seen as weak, unsuccessful, and unattractive. This image of success is often created and then perpetuated by Hollywood. It is then very refreshing to see Hollywood produce a movie which turns this all upside-down. For in the end we see that a man who passes up the corporate ladder to work as a tire salesman, a man who drives a mini-van and changes diapers, and a man who must sacrifice his own time and happiness in order to please his family is the strongest in character, the most successful in life, and is envied by all. This movie gets very deep philosophically and emotionally, but it is also coated in humor. Watching a wall-street business man transplanted into a middle-class, family home is, among other things, FUNNY! 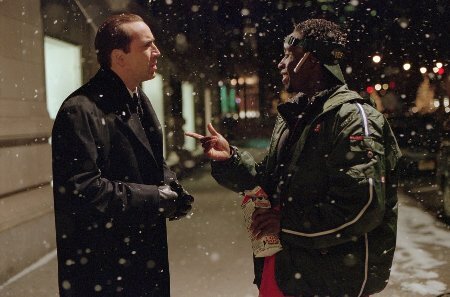 There are many hilarious scenes, such as the first time that Jack Campbell (Nicholas Cage) attempts to change a diaper. And humor is often used as a lead-in to scenes which are purely touching and sweet, such as when Jack's 6-year-old asks him if he is an alien (pictured above). With the title of the film being The Family Man, it is not surprising to see that the focus is always on one man, Nicholas Cage. And Cage does a merit-worthy job of getting us to empathize with a man who undergoes a metamorphosis from one kind of man into someone completely different. And his airport soliloquy at the end is very touching. However, the title also demands that there be a family. And this on-screen family is simply wonderful. I fell in love with them along with Jack. From them we see the good, the bad, and the ugly aspects of family life. But we also see that which is priceless. The could-be wife, Kate (played marvelously by T�a Leoni, who is pictured below) is at times demanding and emotionally unstable. But she is also very understanding, caring, and most of all, loving. She teaches Jack the epitome of self-sacrifice and love when she tells him, "I choose us." The kids are just great. I loved the 6-year-old, Annie (Makenzie Vega). She was so cute and acted just like a little girl would. She reminded me a lot of my own soon-to-be 6-year-old. As I sat there, I watched Jack Campbell fall in love with his family, only to lose it all upon his return to reality. I then saw his determination as he focused all of his energy into desperately trying to reclaim what could have been. It reminded me of myself in many ways, and reaffirmed my commitments to my own family while re-examining my other pursuits in life. On the surface, this movie is very entertaining. It is funny, and probably a little bit corny, but its message is righteous and strong. How would you rate the movie The Family Man? There have been 11905 people to visit this page since Sat, Dec 23, 2000. And you are the first person to visit this page today!